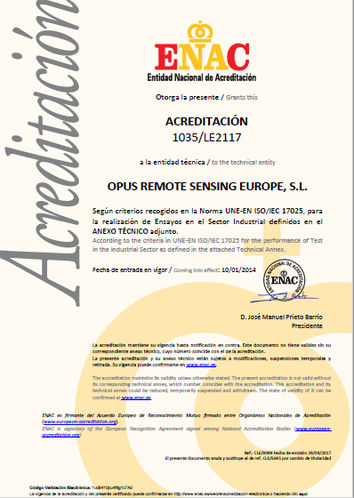 Since 2013, Opus RSE is the only laboratory ENAC accredited according to ISO 17025 standard that is allowed to carry out remote traffic emissions measurements (CO, HC, NO and Opacity) by means of the RSD technology. Our company has become the first laboratory in the world to achieve this international accreditation for remote traffic emissions measurements. This ISO standard fully acknowledges the technical competency of our laboratory as well as the complete reliability of the RSD technology. The entire testing process is supervised by multiple quality checks and metrological controls, including periodical audits by the Spanish Accreditation Services (ENAC). Opus RSE is accredited to remotely measure the following pollutants comming from the road traffic: CO, HC, NO, and Opacity from the exhaust pipes. Measurements must be made according to our Technical Procedure included in our ENAC scope. Further details of our scope can be accesible from here.